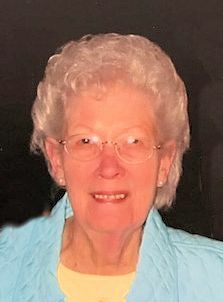 ST. JOHN, Ruth C. “Ruthie” (Holler), of Weymouth, passed away peacefully, after a brief illness, on February 2, 2019, at the age of 89. Born in Boston, Ruthie grew up in Savin Hill and graduated from the Jeremiah E. Burke High School. She worked at Prudential Insurance Co. for 20 years before her retirement. She then became the receptionist at Hancock Park Rehab and Nursing facility in Quincy for many years. In her free time, Ruth enjoyed cooking and ceramics. A devoted mother, grandmother and friend, Ruth will be greatly missed by all who were blessed to have known her. Loving mother of Arthur St. John and his wife Janice of RI, Debra Carnell and her husband John of Braintree and the late Dennis M. St. John. Sister of the late Anna Pecoraro and Doris McKeon. Beloved “Nana” to Jessica Reckner and John Carnell, Jr. and great grandmother to Logan Reckner. Also survived by several nieces and nephews. Relatives and friends are respectfully invited to attend a Visitation Period on Wednesday, February 6th from 9:30 – 11:30 AM in the Cartwright-Venuti Funeral Home, 845 Washington St., Braintree. A Funeral Mass will be celebrated Wednesday at 12:00 Noon in St. Francis of Assisi Church, Braintree. Burial will follow in Blue Hill Cemetery, Braintree. Should friends desire, memorial contributions may be made in her name to St. Jude Children's Research Hospital, 262 Danny Thomas Place Memphis, TN 38105.